No matter what we do or how well we do it, some criticism is eventually going to come our way. And those moments are often some of the toughest we all face in work and life. Hearing potentially negative things about yourself is probably not your favorite activity, and most of us would rather avoid the awkwardness that comes with telling someone else how they could improve. But what do we lose out on when we avoid these tough conversations? One of the fundamental skills of life is being able to give and receive advice, feedback and even criticism. If given and received in the right spirit, could sharing feedback—even critical feedback—become a different, better experience than the painful one we’re accustomed to? Could feedback become a valued opportunity and even a bonding, positive experience? In this post, we’ll explore how to give and receive feedback at work in the best ways possible, along with some of the psychology behind handling critical feedback (in both directions). I’ll also share with you some of the methods in which we offer and receive feedback at Buffer to try and make the experience less scary and more loving. It’s hard for us to feel like we’re wrong, and it’s even harder for us to hear that from others. As it turns out, there’s a psychological basis for both of these elements. Because our brains are protective of us, neuroscientists say they go out of their way to make sure we always feel like we’re in the right—even when we’re not. And when we receive criticism, our brain tries to protect us from the threat it perceives to our place in the social order of things. “Threats to our standing in the eyes of others are remarkably potent biologically, almost as those to our very survival,” says psychologist Daniel Goleman. So when we look at Maslow’s famous hierarchy of needs, we might suppose that criticism is pretty high up on the pyramid—perhaps in the self-esteem or self-actualization quadrants. But because our brains see criticism as such a primal threat, it’s actually much lower on the pyramid, in the belonging or safety spectrums. Criticism can feel like an actual threat to our survival—no wonder it’s so tough for us to hear and offer. Another unique thing about criticism is that we often don’t remember it quite clearly. Charles Jacobs, author of Management Rewired: Why Feedback Doesn’t Work, says that when we hear information that conflicts with our self-image, our instinct is to first change the information, rather than ourselves. But although criticism is more likely to be remember incorrectly, we don’t often forget it. It’s called a negativity bias. Our brains have evolved separate, more sensitive brain circuits to handle negative information and events, and they process the bad stuff more thoroughly than positive things. That means receiving criticism will always have a greater impact than receiving praise. So now that we know what a delicate enterprise criticism can be, how can we go about offering it up in the right spirit to get the best results? Here are some tips and strategies. The most important step is to make sure that your potential feedback is coming from the right place. Here’s a list of some of the main motivating factors behind offering up feedback. After entering the conversation with the best intentions, a next guideline is to separate behavior or actions from the person you’re speaking to. Focusing the criticism on just the situation you want to address—on what someone does or says, rather than the individual themselves—separates the problematic situation from the person’s identity, allowing them to focus on what you’re saying without feeling personally confronted. Starting off your feedback with a few questions can help the other person feel like an equal part in the conversation as you discuss the challenge together. Ashkanasy began by asking her how she thought she was doing. That lead-in gives the recipient “joint ownership” of the conversation, he says. Ashkanasy also pointed to other jobs that would better match the skills of his soon-to-be-ex employee. That promise of belonging helped relieve her anxiety about being cast out of the group she already knew. One well known strategy for feedback is the “criticism sandwich,” popularized by the above quote from cosmetics maven Mary Kay Ash. In the sandwich, you begin with praise, address the problem, and follow up with more praise. In fact, the more of the conversation you can frame positively, the more likely your recipient is to be in the right frame of mind to make the change you’re looking for. In his exploration of the next phase of working together, Reinventing Organizations, Frederic Laloux explores some of the world’s most highly evolved workplaces. One of the cultural elements common to all of them is the the ability to treat feedback as a gift rather than a curse. Many of these organizations use the Rosenberg Nonviolent Communication method, pictured here, to deliver feedback. This method provides a simple and predictable framework that takes some of the volatility out of giving and receiving feedback. So now we know some strategies for offering feedback with an open heart and mind. How about for receiving it? The best strategy for being caught off guard by negative feedback? Make sure you invite feedback often, especially from those you trust. You’ll be better able to see any challenges ahead of time, and you’ll gain experience in responding positively to feedback. If you had to make two suggestions for improving my work, what would they be? How could I handle my projects more effectively? What could I do to make your job easier? How could I do a better job of following through on commitments? If you were in my position, what would you do to show people more appreciation? When do I need to involve other people in my decisions? How could I do a better job of prioritizing my activities? When receiving feedback, it might be tempting to become defensive or “explain away” the criticism. Instead, let the other person finish completely and try to listen deeply. Then ask questions and reflect thoughtfully on what you’ve heard. Stanford Professor Nass says that most people can take in only one critical comment at a time. So if you need some time to reflect on multiple points of feedback, don’t be afraid to say so. While some of us have a hard time hearing negative feedback, there are those who thrive on it. This group has what’s known as a growth mindset. They focus on their ability to change and grow—as opposed to those with a fixed mindset—and are able to see feedback as an opportunity for improvement. 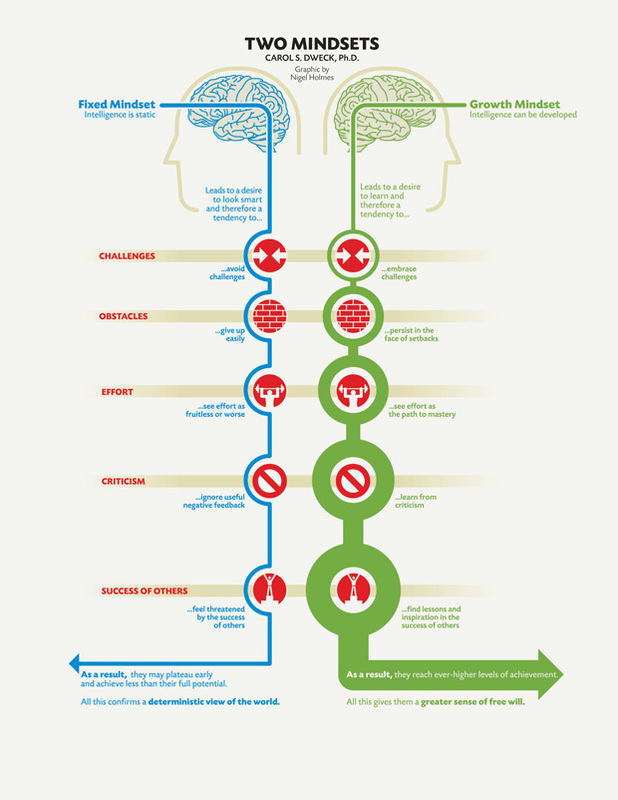 You can learn more about how to develop a growth mindset here. It’s easy to take credit for our successes, but failure is something we don’t like to admit to. For example, we’re more likely to blame failure on external factors than our own shortcomings. But lately, the idea of embracing failure has emerged, and it’s a great mindset for making the most of feedback. Take a page from the “embracing failure” movement and treasure the opportunities you’re given to improve and grow. As with many of the things we do at Buffer, the way we give and receive feedback is a continuous work in progress as we experiment, learn and grow. This process had a few really good things going for it: Feedback was a regular, scheduled part of our discussions, which removed a lot of the fear that can surround it; and feedback always went both ways, which made it feel like a sharing process between two equals. These days, masterminds happen weekly between peers and we’ve moved away from the formalized feedback section altogether as we strive for a more holacratic, less top-down way of working together. But feedback is still an important part of the Buffer journey, and it is offered and received freely by any of us at any time it is applicable. Since feedback often can be sensitive and personal, it tends to be one of the only elements we exempt from our policy of radical transparency. It most often takes the form of one-on-one Hipchat messages, emails or Sqwiggle conversations. Buffer’s 10 core values are our guide to offering and receiving feedback with joy instead of anxiety. Looking at our value of positivity through a lens of feedback, I see lots of great instruction on offering constructive criticism, including focusing on the situation instead of the person and offering as much appreciation as feedback. Since we each take on this goal of positivity, it’s very easy to assume the best of the person offering their feedback to you and that their intent is positive. Additionally, our value of gratitude means that we each focus on being thankful for the feedback as an opportunity to improve in a particular area. Finally, our value of self-improvement means we have a framework for taking feedback and acting on it in a way that moves us forward. Although feedback isn’t generally made public to the whole team, it’s not uncommon for team members to share feedback they’ve received and the changes they’re making as a result in pair calls or masterminds. I’m sure our ideas will evolve even further on this idea (in fact, during the time it took me to write this we opened up a whole new discussion on feedback and resolving issues). Maybe you can give us a hand? I’d love to hear your best tips for giving and receiving feedback in the best spirit, or to learn how you handle feedback at your workplace! Share your thoughts with me in the comments. What a fantastic article, possibly my favourite on the blog. This is something I’ve found myself wondering about Buffer more than once, specifically just how much I could be aligned with your values – so this post has been really eye opening for me. This really was my one sticking point. I guess I should have asked! Feeback and criticism is vital for growth, but so hard to get right. It’s great that you’re meeting this head on. Thanks for sharing and very well written Courtney. Hey Luke! Thanks so much for the kind words! I’m glad this post answered some of the questions you had been pondering. :) It’s definitely a work in progress here at Buffer as we work through the best way to handle this element that, as you mentioned, is so vital. I’m looking forward to keeping you posted on how things evolve! You’re welcome, it’s a great post. Look forward to hearing more in the future, these tricky areas are the things most people don’t talk about and therefore the hardest to learn how to do well! Courtney, thanks for this amazing post! For me, it started a train of thoughts! It took some time to put them into words, but I think I could maybe add some more aspects. First at all, to start with more or less philosophical thoughts: one thing I recognized is that the point with criticism sometimes is a linguistic one. In German, “Kritik” is first at all describing an evaluation of something, could be positive, negative or neutral. Everybody is aware of that, but thus doesn’t prevent everybody from negative feelings if it’s coming to criticism, so receiving “Kritik” is a very negative thing. Using the term feedback kind of clears away this problem; don’t know if it’s the same in English? For me, everything narrows down to the situation which causes the criticism or feedback, and especially negative one. So there could be two scenarios. The kind of best one (the bufferish one – I assume :-)) is an ongoing process, where giving and receiving feedback are self-evident and lead to a common understanding of how to build/create/code/finalize a project. I assume that feedback here doesn’t lead to any negative feelings but to adjustments or some more experiments. The opposite situation is one, where expectations on results of a task/project/… are not the same on both sides, assuming that the person who receives the feedback did the best she or he could have done. Out of my own experience, this is a tricky one, as it leads to the question if there was enough communication or if the initial briefing was detailed enough to get to a common understanding of the project. If you’re the one giving feedback, it’s maybe the best asking yourself if there might be anything you missed and therefore it might be not the fault of the person who’s providing the results. So if you need to criticize somebody, it’s maybe yourself. If you’re the person receiving the feedback it’s a little bit more difficult as you shouldn’t end up defending yourself referring to a insufficient communication or briefing. It’s just up to you to learn from this and do it better the next time. Hi Tim! Wow, these are such amazing reflections and I truly appreciate you taking the time to share them here! I love your thoughts about self-reflection and over-communication especially – those two elements feel absolutely essential to feedback that can help you and your team grow. And I completely understand what you’re saying about how feedback from your spouse/partner feels different than any other type. I’m not sure why either, but I have experienced the same thing! Just as important as what is said and how it’s said is this – who is saying it and what’s their intentions? For example, some managers give criticism with the intent to build a case that could help them fire and/or have an employee moved somewhere else in the company. In this scenario, criticism only lets the criticized employee know that they are getting closer to the proverbial edge (where they’ll be pushed off without a parachute). The above is an example of office politics. It’s disgusting but not that uncommon. If the criticism is coming from someone you really look up to, admire, and aspire to emulate one day – I think the criticizer doesn’t need to be nearly as careful with their tactics or words. You know these words are coming from someone that knows what they are talking about, they are better than you at this thing, and they care about you getting better faster than they were able to due to not having access to the same level of mentorship. Did Steve Jobs use the popular sandwich technique? I don’t know for sure, but accounts suggest that he was to the point and even cruel. But, everyone knew it was coming from someone who knew his stuff and cared about success. Does Stephen King need to be careful with his word choice to an aspiring horror/suspense novelist? Does Derek Jeter need to choose his words carefully when teaching a rookie how to play shortstop? Does Stephen Hawking need to inject some positivity when he tells you that you’re off the mark with regards to black holes? I’d argue that the answer is no. The more respected you are in the area in which you are dishing out criticism, the less careful you need to be in how you do it. Hi Josh! This is such a fascinating point of view and I really appreciate you taking the time to share it! I know I’ve read about many leaders who used more of a “tough love” approach that seemed to be very effective. I think if that technique is applied across the board with everyone, it could really work. I’ve gotten to rather enjoy thinking about each word I speak; that’s probably the “Buffer effect.” :) Appreciate your point of view here! Definitely not suggesting you’re off the mark. In fact, most of us should certainly watch how we phrase things and follow the advice in your post. I just wanted to add that these rules apply to almost all of us, but it is possible to get to a place where within a certain domain, you can care a lot less about your choice of words. Also, your point about applying this technique across the board is key. I think inconsistency from the higher ups is a culture killer. Using Steve Jobs as an example again, if he was to the point and kind of cruel to everyone, people start to appreciate that this is just the way he does business and the cruel words probably hurt a little less. Then, someone like Jobs has to spend significantly less time and energy getting his point across, which is key for someone in his position where managing bandwidth is key. Thanks for the discussion Courtney! Courtney, what an incredible post! As you know, as we’re exploring a new feedback process internally, I feel that this could be extremely valuable! I especially love the “ask for feedback often”, I feel that that makes it so easy to mention even the smallest thing that’s on someone’s mind. I remember that when Steven started with us, he asked for specific feedback after every week and that was such a great feeling. Thanks a bunch, Leo! This one felt so great to research and dig into. I learned so much, including a lot about myself! Asking for feedback seems to be a real key. I’m looking forward to putting that into practice! This is a really nice post, because it is very comforting to see that there are people focused on make community living essentially better. But especially because it brings up some contrary thoughts too. I think sometimes calling everything “great, awesome and really incredible” is confusing and therefore not always helpful. Very important to receive criticism and appreciate it. Thank you Courtney for your article! Hi Christina! This is a really great point and I appreciate you bringing it up. The main indicator for constructive feedback seems to be clarity of understanding, so it’s true that too much positivity could confuse the point! I think working without ego could be the best way to separate criticism from feelings of shame and fear. It’s something that I’m still working on myself! Sometimes the “criticism” that seems most necessary in the moment, when tabled for a day or two, isn’t even that important. These are all good tips and sort of bring me back to my psych major days. Bridget, you’re absolutely right! I know I’ve often reflected on feedback for a few days before sharing it and watched as it took on a new dimension or even diminished entirely. Excellent point to add! Great article Courtney. I have a feeling that because of how well you wrote this and the thought you put into it that you’ll now be much better at giving people feedback and motivating people at work without making their life a living hell ;) We can all get better at dealing with people, whether it’s at work or not. That’s why articles like this with so many tips are so great. I really like how you wrote the article by looking at both sides of the story in the same article too. I linked to your article this week from my blog, Life Thinkist, which usually posts 1 great link a week. Life Thinkist is all about improving your life, getting things done, and being happier. Here is a quick overview of another article I liked about understanding people. I always think about this excellent article when dealing with people at work. Especially when people might be in a bad mood, for instance if a manager or someone else gets upset at you for something. For me, the key takeaway here might be to give people positive feedback and praise everyone as often as you can. To inject positivity as Courtney put it when talking about the criticism sandwich. And not just when you have to give negative feedback. If you get in the habit of telling people how much you appreciate them and give them a genuine compliment every day, then they will feel valued and respect you. A negative comment or suggestion for improvement once in a while will not only be accepted. They will welcome it and strive to make the change for you because you are one of the very few people in the world who has taken the time to appreciate them all the time, for who they are and what they have done. To make the habit, see how many compliments or praises you can give out each day and even keep track by making checkmarks on a calendar. Praise people, compliment them, tell them the great job they’ve done, truly appreciate who they are and what they are doing, and acknowledge the great work they do all the time. Give honest praise and sincere compliments to people every day, all the time. Hey there! I really appreciate you taking the time to share these insightful thoughts here. Your intuition is absolutely right; I do think writing this post has given me a bit more insight into the topic! And I love your point about offering positive feedback often. That feels like such an important factor towards creating a relationship that is accepting of all feedback. Excited to check out the link you’ve shared! Thanks Courtney. Wow, thanks for taking the time to respond to me and everyone else. As if writing such a thorough and good article like this isn’t enough work ;) Hehe…you’ll be a manager in no time if you aren’t one already. I’m sure you got lots of other ideas for posts, but if you do ever post more about people skills at work, you might consider making single tip posts that talk about just one tip or idea in them. Even if you reuse ideas from a great longer post like this. I try doing that sometimes. It can be less work, and sometimes even more people will read a shorter article about one tip, and grasp the advice in it better too. But of course, it depends on what the goals of your articles are too, or if you want them to be a certain length or something. Again, great article. The effort and thought you put into getting all these different ideas in this article was awesome, like linking it to Buffer’s values and feedback process. You found so much good information. I’m glad it looks like quite a few people read this and got something out of it. Thanks for the ideas. We’re setting up a recurring review process and this comes just at the right time. Sounds great, Jeroen! Hope there are some elements here that might come in handy! That was a really great read, Courtney. I especially enjoyed the ‘Focus on the behavior, not the person’ and ‘Cultivate a growth mindset’ parts. When giving or receiving feedback I’m always asking myself: How does the feedback benefit our users. When we frame everything with our users in mind it moves the focus off of the individual and to our users, allowing us to have shared purpose and not feel so exposed. Wow, sounds like you have a great mindset for enriching your teammates, Andrew! Hi Courtney, nice article. I would like to mention a slightly different point of view here. It tends to be overly formal. Because you have to preplan and script the sandwich to make it come out correctly, the process can feel formal and judgmental to the employee. He has also offered few keys for giving effective feedback. Thanks so much for sharing this article; it’s got a TON of great points! I think the bit about authenticity resonates the most with me. It feels like it would be great to get positive feedback at least as often as one gets critical feedback, but perhaps they need not happen in the same sitting. Maybe it’s better if they don’t! I find that frequent feedback–both kinds!–kind of gets you in the right mental space to be a bit more accepting of feedback, even if it’s critical. Can definitely see how the sandwich might begin to seem inauthentic! Thanks for bringing up that great point! Just put “Thanks for the Feedback” on my book list; thanks so much for the suggestion! After you read it, let me know what you think! A mental note that sprang up during this article is the gift of learning a musical instrument. Every child I know who took lessons or joined the band at school developed their ‘Growth Mindset’. This is an amazing, well articulated and extremely informative post. Thank you for sharing.